We offer Box Strapping Machine. We are Manufacturer, Supplier of Automatic Box Strapping Machine in India. 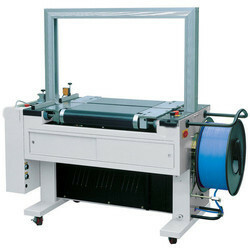 We have an eminent name for offering a vast array of Semi Automatic Box Strapping Machine. This product is manufactured using only quality tested materials. We deal in Automatic Box Strapping Machine of best quality and we offer them to our clients. It is manufactured and designed using leading edge technology and advanced machinery. Used for packing and binding paper carton, wooden boxes and paper & parcels, this Automatic Box Strapping Machine has a fast and large production capacity. - Instant heating in just 20 second . - Magnetic drive for faster & speed / packing . - Lift type top cover alows convenient maintenance.